Search the clearance section! Many perfectly functioning appliances go on clearance daily, whether it be because they were returned (for whatever reason), or because the store is trying to clear out their stock. Regardless, it’s definitely worth checking out the selection before opting for a brand new, in it’s box, appliance at full price. Plus, you can often times pair your discounted item with another coupon and save even more! 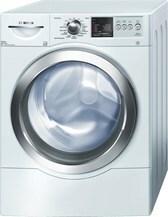 I bought a Bosch washer and dryer (essentially brand new), with all the bells and whistles, and saved 50%. We had planned on buying brand new Whirlpool series when the sales guy told us about the Bosch Vision 500 series that had been returned just earlier that afternoon. We were hesitant at first, mainly because the thought of buying a “semi-used” washer or dryer made us a bit queezy, but then we saw how brand new they looked (the store had cleaned them thoroughly). The previous owner returned them after just 1 month of use and stated it was because his wife didn’t like them (pshh, right). In the end, we spent about $1,200.00 total (they retail for $1,249.00 each) which is basically like buy one get one FREE! 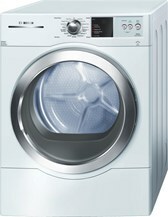 Here is a photo of the Bosch Vision 500 series, just like the ones I purchased- I’d show you the actual washer and dryer except I’m in the middle of catching up on a few weeks of laundry and it’s a mess…you understand though, right?